EndureAir, Inc. provides an innovative VTOL (Vertical take-off and landing), high endurance, intelligent UAV solutions to solve last mile logistic problems. They believe commercial UAVs should become the de-facto solution for last mile deliveries in remote areas. EndureAir's UAV comes with a robust, rugged form factor and is the cheapest $/mile/duration solution to efficiently solve the "last mile delivery" problem. They have already solved the issue of endurance with their vehicle capable of providing more than 2 hours of flight time that can carry a six (6) lb payload and fly 50 miles round trip. Their focus is to implement deep learning AI (artificial intelligence) for flight safety, finding safe location to drop payload and deciding optimal path. 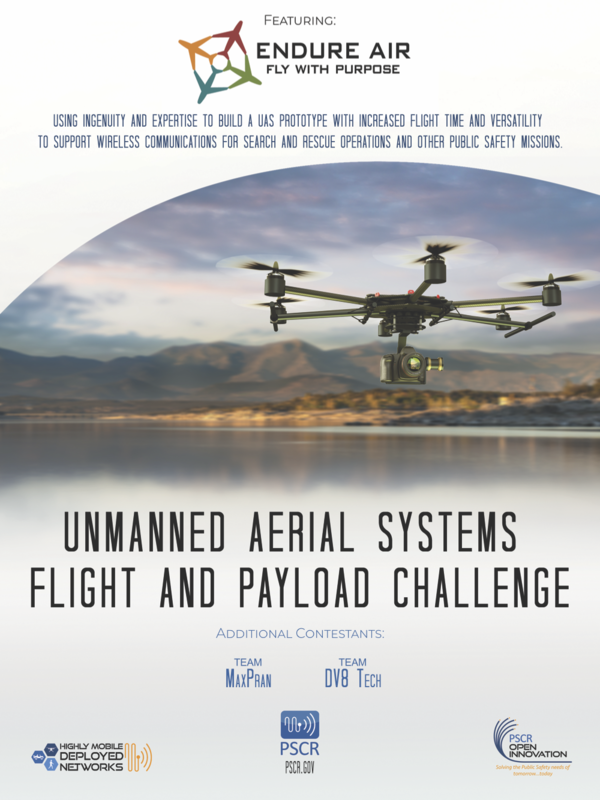 Their UAV is better than fixed wing or quad rotors and is a traditional very stable platform proven to be effective in large scale aerial delivery systems. Dr. Abhishek is an Assistant Professor at the Indian Institute of Technology Kanpur Research with over eight years of specialization in rotary wing aeromechanics, hover capable autonomous Unmanned Air Vehicles, multi-body dynamics, inverse flight dynamics, helicopter and innovative VTOL, air vehicle design, and wind turbines. He received his Masters of Science and Ph.D. in Aerospace Engineering from the University of Maryland, College Park. Yamin Durrani is one of the founding members of EndureAir, Inc. with over 14 years of experience in the technology sector in executive management, sales, marketing, and research and development. He received his Master of Science in Electrical Engineering from Texas A&M University and Master of Business Administration from Santa Clara University Leavey School of Businesss. Nidhish Raj is pursuing his Ph.D. in Aerospace Guidance and Control, Geometric Mechanics/ Control from the Indian Institute of Technology (IIT) Kanpur. He was the lead developer of the NAAVIK autopilot as a Research Assistant at IIT Kanpur, focused primarily on developing drivers, control and guidance algorithm for various platforms. Ankur Duhoon is a Design Engineer for EndureAir, Inc. with several years of experience in design and manufacturing a novel payload delivery mechanism for UAS, in addition to developing an IC engine powered variable pitch quadrotor at the Department of Aerospace Engineering, Indian Institute of Technology (IIT) Kanpur. His field of interest is in design and development of UAVs. He received a dual degree, Bachelors of Technology and Masters of Technology in Aerospace Engineer from IIT Kanpur. Sagar Setu is one of the founding member of EndureAir, Inc. with several years of experience in start-up companies in the field of aerial logistics and IoT with more recent focus on developing the first prototype of the delivery vehicle. He is pursuing his Ph.D. in Aerospace Engineering from the Indian Institute of Technology (IIT) Kanpur with a focus on autonomous landing of helicopter post engine failure. Karthik Sathyanarayanan is a Design Manager at Hindustan Aeronautics Ltd with several years of experience on helicopter vibration, structural dynamics, and software development. He is pursuing his Masters of Technology in Aerospace Engineering from the Indian Institute of Technology (IIT) Kanpur with a research interest in helicopter flight dynamics modeling, rotary wing structural dynamics, design of rotary UAS, structural design and aeroelastic analysis. Dr. Jayant Sirohi is a Researcher at Cockrell School of Engineering with a focus on solids, structures and materials, and interests in micro/unmanned aerial vehicles, vertical lift aircraft, fixed-wing and rotary-wing aeroelasticity. He held roles in industry and academia and is currently the Principal Investigator of the Vertical Lift Research Center of Excellence. He received his Ph.D. from the University of Maryland, College Park. Team EndureAir collaborated with members of the Indian Institute of Technology (IIT) Kanpur on this challenge to create a helicopter with rotors in a tandem configuration, powered by a single gasoline engine. The airframe, transmission and the controls were designed from scratch, while the rotor heads were utilized from the existing 'Endure 800' conventional helicopter platform, which has a proven track record. A tandem configuration is more efficient in hover for a given payload and provides more lift with compact rotor arrangement, thereby the apt solution for the given mission requirements. Helicopters in tandem configuration have many advantages over conventional helicopter (single main rotor + tail rotor). In tandem configurations, both main rotors produce lift and cancel out the torque of each other. Therefore, all the power is used for lift production and none is wasted in countering the torque. Their approach of using a helicopter in a tandem configuration, coupled with gasoline as an energy source, provides maximum lift as well as the long endurance required to meet the challenge. Generally, in a helicopter tandem configuration, the front rotor and rear rotor rotate in different planes i.e. the front rotor is in the full developed slipstream of the rear rotor. This arrangement of rotor planes is more efficient as compared to when rotors are in the same plane. Team EndureAir decided to keep the plane of rotation of both rotors in the same plane since it was easier to implement structurally given the short timeframe for this competition. A good design on paper saves a lot of time and resources. Follow the challenge timeline in order to keep track of the progress. Flight Electronics/ wiring harness = Open source Autopilot Hardware, GPS module, Telemetry, Power module, Transmitter, Receiver, Electronic ignition unit and Li-Po batteries.